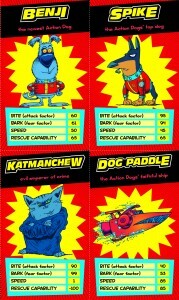 Action Dogs! – Dogs saving mankind! When we were young, we used to love watching Gerry Anderson’s shows on TV. 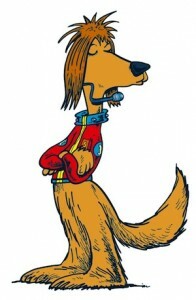 Thunderbirds, Stingray, Captain Scarlet, Joe 90 – they were all great fun and used technology to excite and amaze us viewers.We decided to write a series where the heroes used similar high-tec machines, but we thought that we’d give it a twist – what if the heroes weren’t people, but dogs? 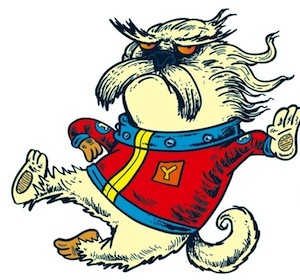 And of course these dogs would have to have secret identities and have a secret base. 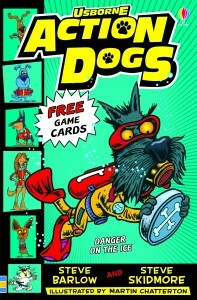 And so, Action Dogs was born!We wanted these books to be highly illustrated and Martin Chatterton was chosen to bring our characters to life. We love what he’s done – We hope you do too. 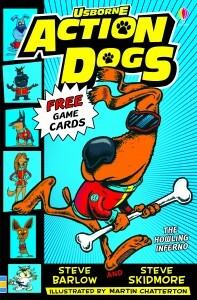 There are even free game cards in every book, so you can play along with the Action Dogs! The world is in deadly danger and only one team of heroes can save it… Six highly trained daredevil dogs who fight crime with their bare paws – and their hi-tech gadgets. 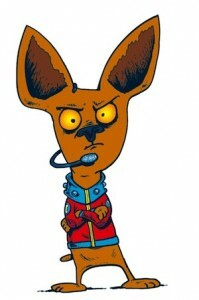 It’s time to call – ACTION DOGS! 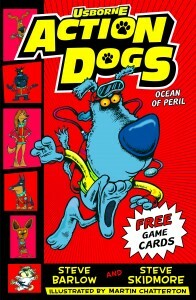 When Benji accidentally discovers the secret HQ of the Action Dogs, he seizes the chance to join their team. 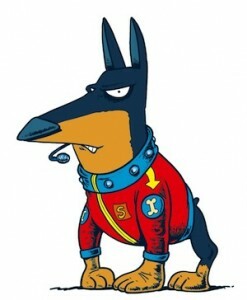 But is he strong enough to stand up to the Action Dogs’ deadly enemy – the dreaded Katmanchew? The 2Steves say… “This is a mixture of Thunderbirds, Wallace and Gromit, Batman, Stingray and Looney Tunes! We loved writing it – hope you enjoy reading it. Catty crime lord Katmanchew is claws away from stealing a world famous painting and holding it to ransom. This is a job for Action Dogs! Bu their mission looks set to fail when they get trapped in a vault in a burning basement. Benji and the bonecopter are their only chance of escape. What a pity he can’t fly! The heat is on! Evil kitty crime lord Katmanchew has unleashed his most diabolical weapon yet… and Antarctica is in meltdown. The fearless Action Dogs wade in to stop him, but when three of the canine crusaders are captured, it looks like their mission will be purrmanently put on ice. 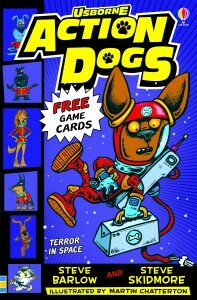 Get some FREE Action Dogs stuff!